In the first part of the blog, I’ve described how to establish a secure tunnel between the SAP Cloud Platform Trial (Cloud Foundry environment) and the Cloud Connector. In addition to that we have configured an Access Control so that we can now access and consume securely data from an on-premise system. 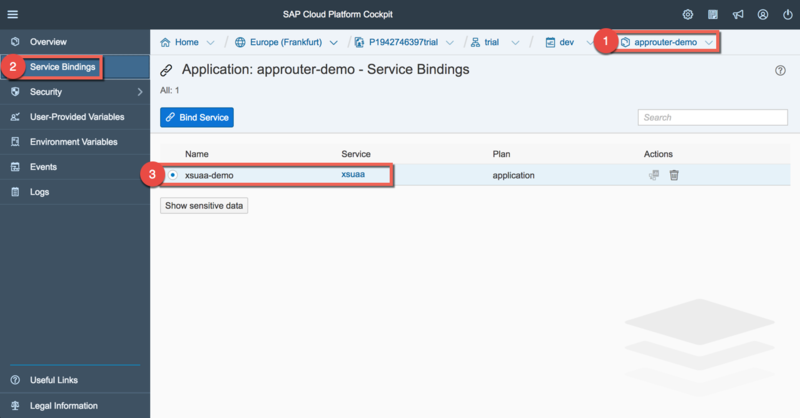 In the second part I will explain how to configure SAP Cloud Platform Connectivity so that a web application can consume the odata service of the existing on-premise system. 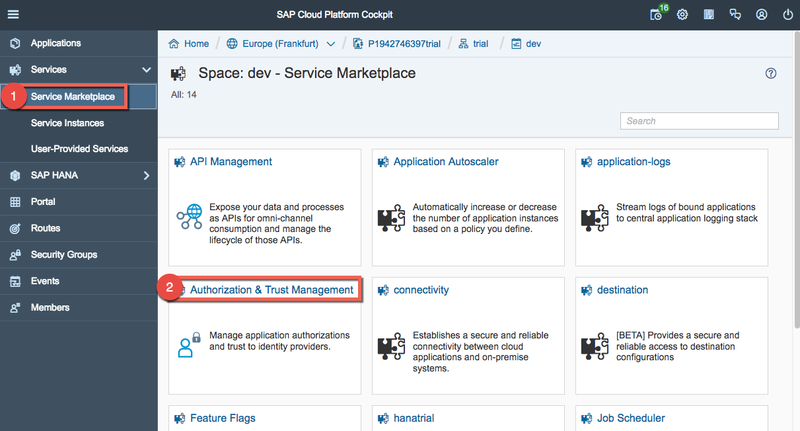 Note: many configuration steps of this blog will be done via the SAP Cloud Platform cockpit. Be aware that you can do exactly the same thing via the Command Line Interface of Cloud Foundry. More details about the CLI can be found here. 1. User calls the webApp through the AppRouter, which provides a central point of entry to business applications. 2. The request is redirected to XSUAA and the user needs to login. Then a JWT1 (JSON Web Token) is created and sent to AppRouter. JWT1 is then cached by the AppRouter. 3. AppRouter forwards the request to the relevant Web-app URL which is defined as destination, it also passes the JWT1 token with credentials. 4a. The WebApp requests a JWT2 to access the destination instance. JWT2 should be cached for better performance. 4b. In parallel the WebApp requests a JWT3 to access the connectivity instance. JWT3 should be cached for better performance. 5. The WebApp requests destination configuration by sending JWT2. 6. The WebApp sends request to the connectivity instance with JWT3 and the Authorization header. 7. SAP Cloud Platform Connectivity forwards request to the Cloud Connector. 8. Cloud Connector sends request to the on-premise system. 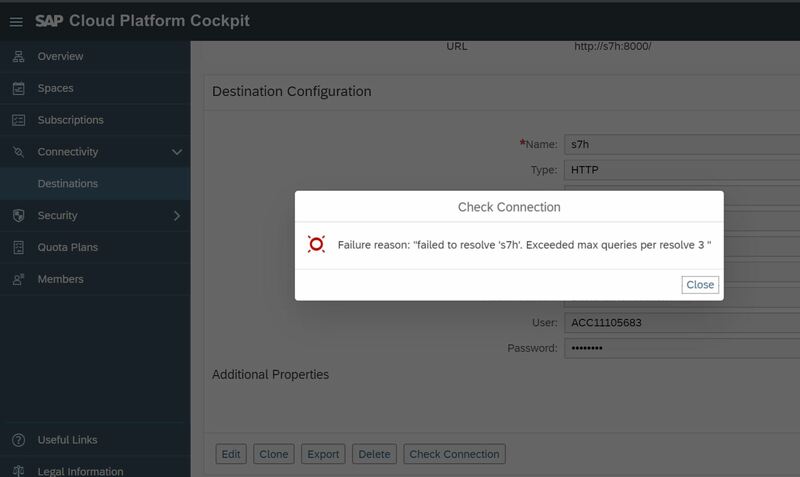 To create a destination, go the SAP Cloud Platform cockpit and navigate to your Subaccount. Then go to “Destinations (beta)” under “Connectivity” and create a new destination. Configure now your destination so that you can consume the data from the virtual host previously defined in the Cloud Connector. Note: if you are using the app available in the sharepoint, be sure to use the same name of the destination or change it in the webApp directly. Now that we have the destination defined, we can create a destination instance in the space. Go to the section “Services Marketplace” under the “Services” tab and click on the Destination tile. Then click on the “Instances” section and create a new instance. Keep “lite” as plan and click “Next”. 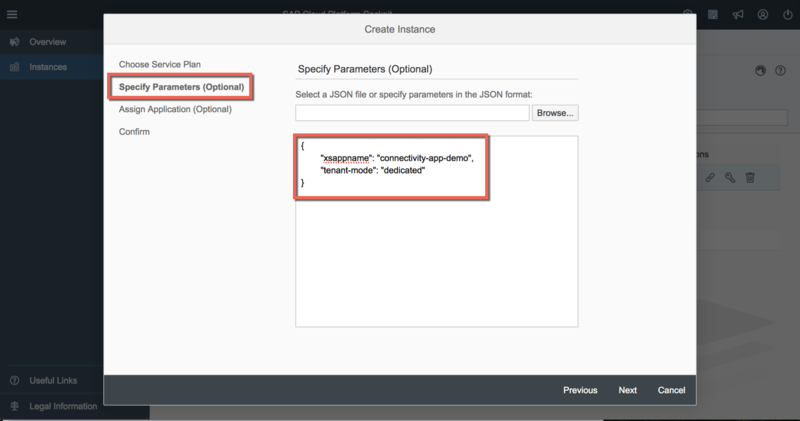 Then skip the next 2 wizard options (Parameters, Application assignment) and add an instance name (e.g. “destination-demo-lite”). There are different ways to bind the application to the destination service. We will do it later on by adding the name of the destination instance in the manifest of the application. During the deployment of the app, the binding will be then added automatically. SAP Cloud Platform Connectivity provides a standard HTTP proxy for on-premise connectivity to be accessible by any application. Proxy host and port are available in the credentials of the bound connectivity service via the environment variable “VCAP_SERVICES”. More details on how to interpret VCAP_SERVICES can found in the official CF documentation. 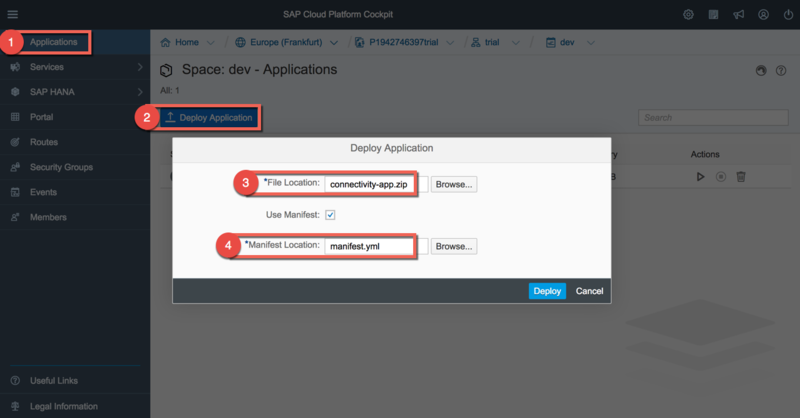 In order to consume the data coming from the on-premise in the application via the HTTP proxy, we need to create an SAP Cloud Platform Connectivity instance and bind it to the application. When a binding is created the application gets connectivity credentials in its environment variables. More details about it here. Ok, let’s create an connectivity instance as we did for the destination instance! Go to the “Services Marketplace” under the “Services” tab and click on the Connectivity tile. Keep “lite” as plan and click “Next”. 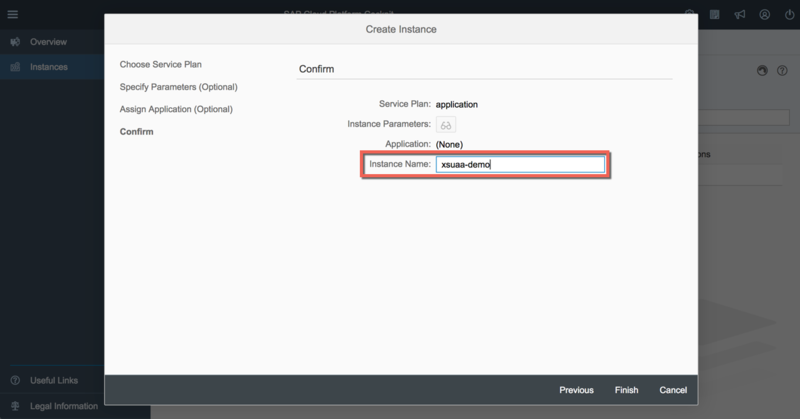 Then skip the next 2 wizard options (Parameters, Application assignment) and add an instance name (e.g. “connectivity-demo-lite”). Like the others instances, the binding will be done by adding the instance in the manifest of the application later on. This central identity management service for the Cloud Foundry environment manages application authorizations and the trust to identity providers. By calling the application, the user will be redirected to the XSUAA and will be prompt to give his credentials. It will then achieve certain checks like verifying the OAuth client, client’s scopes, user’s scopes (Scopes are permissions to access one or more resources). Assuming everything is fine, the user will be authenticated and the XSUAA will redirect the browser to the application. In a second step the application will take the client Id and the client secret and will talk directly with the XSUAA to get an access token. 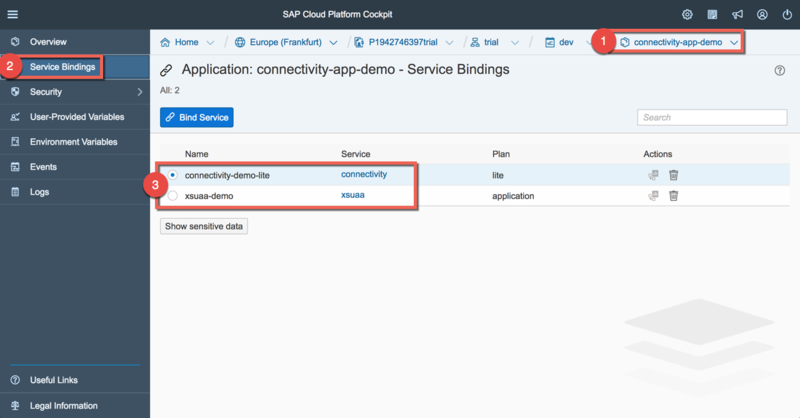 Then the application will sent both tokens as HTTP header so that it can consume the backend system via the SAP Cloud Platform Connectivity. The next step is then to create an instance for the XSUAA. 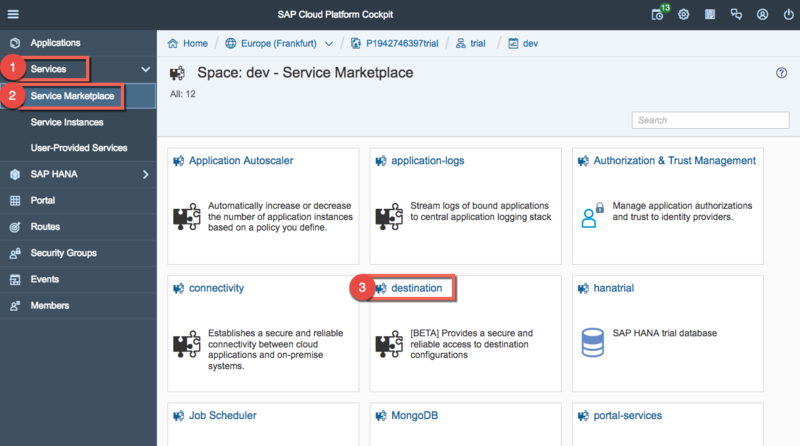 We open the SAP Cloud Platform cockpit and go to the “Services Marketplace” under the “Services” tab and click on the XSUAA tile. In the wizard we keep “application” as service plan and click “Next”. Then we add the following parameters in the editor and then click on “Next”. In the last step of the wizard, we can add an instance name (e.g. “xsuaa-demo”). The same name will be added in the manifest of the application later on. Note: As mentioned before, we will bind the instance at the end, once we have deployed the application. For this demo I have preconfigured a standard application router. Is it really needed? No but it makes my life easier and it’s a kind of best practise in the Cloud Foundry world. 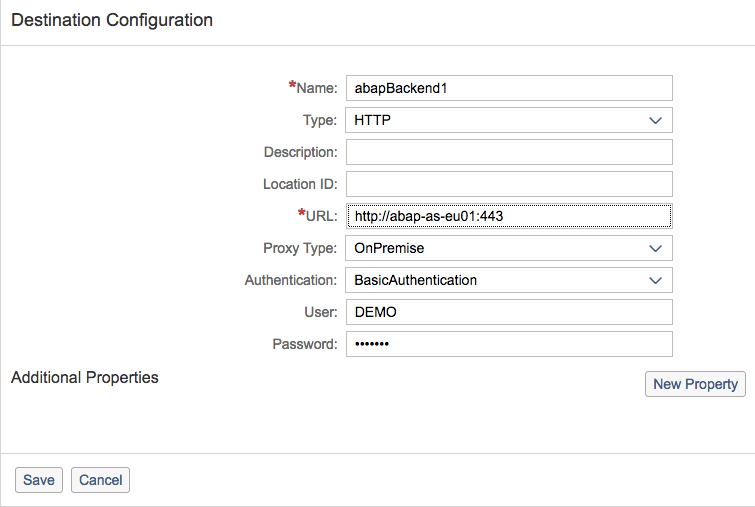 So in our scenario the application router is the component that acts as our oAuth Client. Concretely that means that by calling the application router in the browser, the end-user will be redirected to the XSUAA in order to login. Now let configure the manifest file of the application router before we deploy it. Be aware that it should be unique, then you can for example add you trial-user to the name. In my case it would be “approuter-demo-p193274639trial”). Do not use any underscore in the hostname. It may contain only the ASCII letters ‘a’ through ‘z’, the digits ‘0’ through ‘9’, and the minus sign. 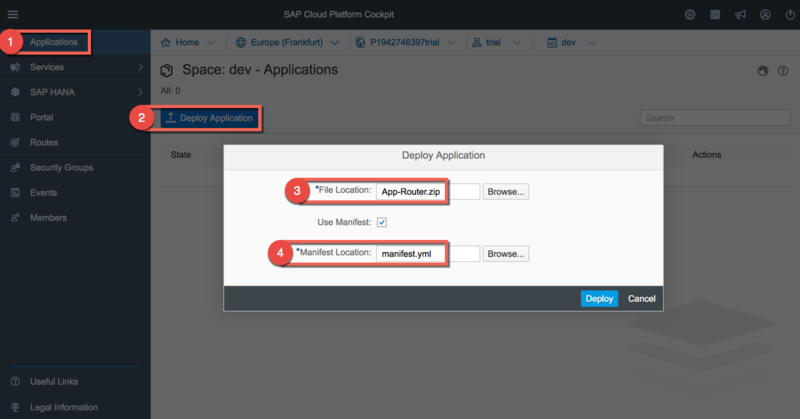 In order to deploy the application router, we go to the “Applications” section in the SAP Cloud Platform cockpit. There we can click on “Deploy Application” and add the archive file and the manifest. As we have defined the XSUAA service in the manifest, the binding will be done automatically. You can verifying it by clicking on the application router name and then on the “Service Bindings” section. Note: by changing the name of the application, a change needs to be done in the file application.properties. You can find it here: /src/main/webapp/security/xs-security.json. Before deploying the web application, let take time to see where the magic happens. The most important file is the connectivity servlet, which is responsible to propagate the user JWT token via headers. // get value of  "onpremise_proxy_host" and "onpremise_proxy_port"
For more details, you can can download the full code at the bottom of the page. 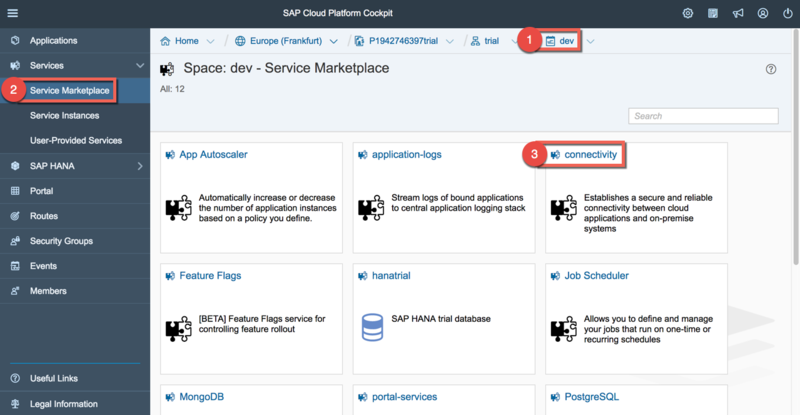 In order to deploy the web application, we go again to the “Applications” section in the SAP Cloud Platform cockpit. And again we click on “Deploy Application” and add the archive file and the manifest. To verify that the manifest has taken care of the binding, we can check the “Service Bindings” section of the web application if the services have been added. That’s all! Now we can call the application in the browser. In order to get the URL, we go to the “applications” tab and click on the “approuter-demo”. Here we can find the URL of the application router. The route to the web application has been configured in the /approuter/xs-app.json file of the application router, so that we need to add “/app/” at the end of the URL. Note: by calling this URL, the destination “dest-to-app” defined in the manifest of the appRouter” will be called. Here again a copy of the manifest. By opening this URL in the browser, the user will be redirected to the XSUAA in order to login. After the login, the XSUAA redirects the user to the web application, which called the odata services of the on-premise system via the Cloud Connector. Here is then the result. You want to try it by your own or you want to see the code in details. No problem, you can download the code here. 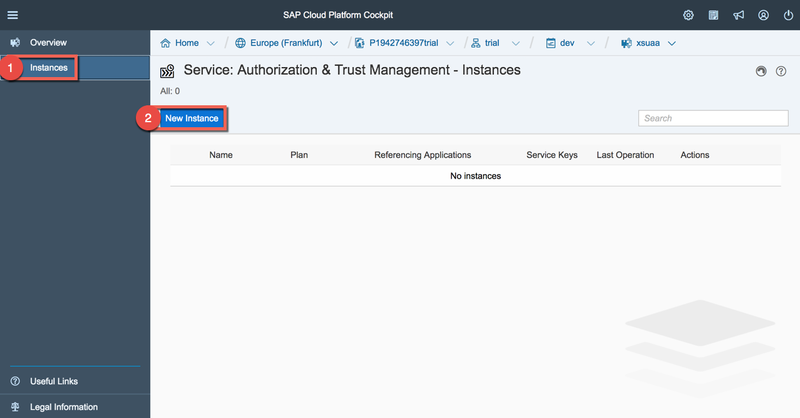 Some improvements need to be done for sure (for example the way to save the backend credentials 😉 So at least I hope it helps you to better understand how to use the the SAP Cloud Platform Connectivity in the Cloud Foundry environment. In the next part of this blog serie, I will explain how to replace basic authentication with principal propagation. Stay tuned and send me your feedback. Here again the repository with the code. For principal propagation related questions, please have a look at the 3rd part of the blog series. 10.11.2017: Due to new buildpack, the manifest file of the web application has been updated. 27.11.2017: Extract the SAPUI5 Library of the webApp + Adding a destination for SAPUI5 in the manifest of AppRouter. 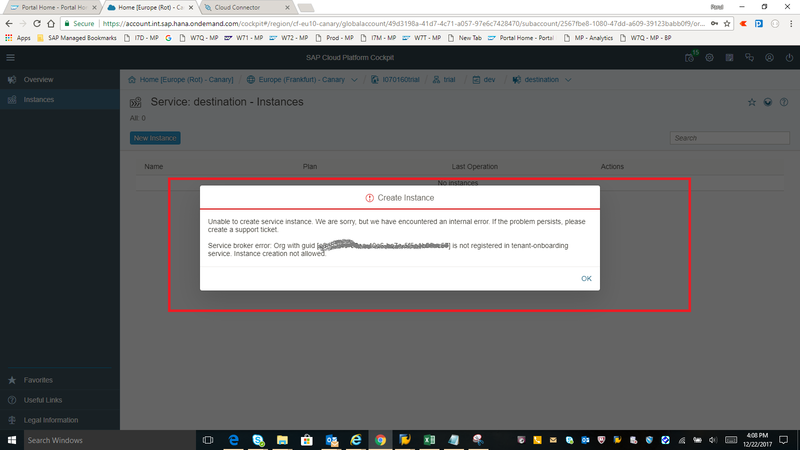 15.12.2017: Adding the steps for using the SAP Cloud Platform Destination Service. 09.01.2017: Small improvements in the blog for a better understanding, for example adding the p-user to the hostname in the manifest. 01.03.2018: Hint that you should not use any underscore in the hostname of the appRouter or the application. 09.08.2018: Added the link of the 3rd part of the blog series explaining how to use principal propagation. Question about “you can can download the full code at the bottom of the page”. What link on this page could be used exactly? You want to try it by your own or you want to see the code in details. No problem, you can download the code here. Let me know if you have problem with the link. The link does not work. Could you please restore the link? Thanks for the hint. I have updated the expiration date. It should be fine now. Hi Robert, can you please try again? Thanks. The link has expired. Would you mind resharing it please? Thank you in advance. I am not able to find any documentation on the Principal Propagation for CF. Based on the Cloud Connector itself, I guess it should be possible (I see that you added support for the JWT-based SSO by extracting the principal from the token). Could you indicate where we could find some documentation on this feature? Also, is this feature “official” or still “beta” (i.e. work-in-progress)? Do you have any info on when the connectivity services will become available for the US West (CA) Beta site? we are working on making it asap available on US West (CA) but unfortunately I can’t give a date right now. Stay tuned! We are wondering whether we can directly consume Connectivity service from UI level? If not, can we implement similar logic in NodeJS instead of Java code? Did you find out anything in regards to implementing similar logic in nodejs? cannot opt enough for a node js oriented version of a simple connectivity/destination(?) scenario! Made a small npm package scc-connector which might be of help if you want to build a plain Node.js app for cloud foundry sap cloud platform with xsuaa and connectivity. Sounds good. I will have a look at it 😉 Thanks. Hi! Great work, that is exactly what I want to achieve. However, I am facing some difficulties, so I think I am doing something wrong. What happens when i do a request to root (/) now is just a ‘Error’ in the console. What am I doing wrong? 🙂 Thanks. great and very helpful blog! 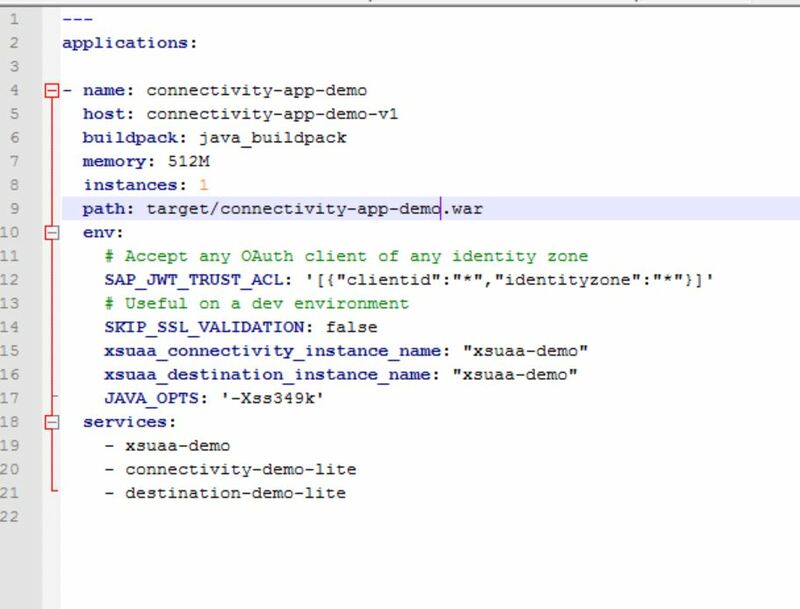 There’s a dependency to group “com.sap.xs2.security”, artifact “java-container-security”, which doesn’t seem to be public available. Are there any plans to move this into Maven Central or are there any alternatives? You’ll have to change the version of the dependency declaration to the one provided in the zip file to make it compile. I didn’t know that it’s not available in Maven Central. Possibly because of legal reasons, but I don’t know why. Sorry about that. An execellent tutorial. It did help me in past. However, currently I’m working on a UI5 application on CF which needs to connect to another CF application through destinations. I understand the process to use destinations in CF is different than in Neo. There’re references for making a request through destination using JAVA, however, I couldn’t find any resources on how to do so in UI5 application. Can you please assist me with this? Or, do I’ve to create an MTA project, make the request through JAVA code and display the data in UI5 application? Any help will be much appireciated. Yes, you’ll need an application acting as a proxy here. It’s not necessary to write this application using Java, but it has to run in the cloud (not in the users browser). 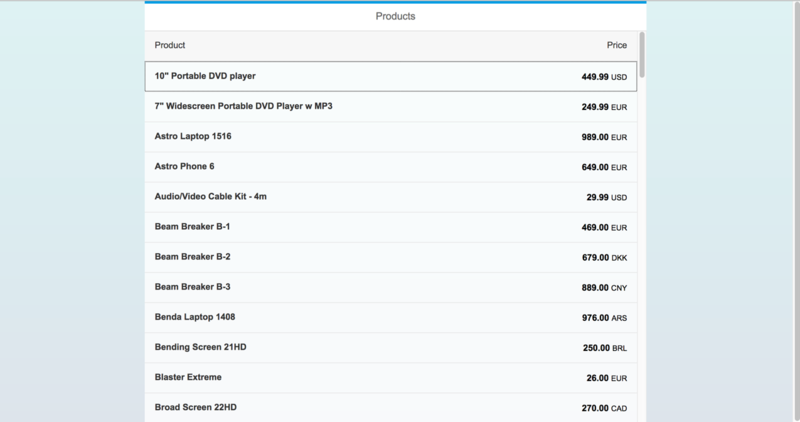 A very simple application, which allows your UI5 application to fetch the connectivity details and the UI5 applications connects directly to your second CF application. A (quite more complex) application which fetches the connectivity details and executes the request on behalf of the UI5 application and redirects the result. While the first solution should be easier to implement and provide better performance, it is not usable if the CF application requires authentication using some kind of technical user (as those credentials would be exposed to the users browser). As described in sample code, only ‘HTTP’ protocol supported here. My question is, can we use ‘https’ protocol as virtual host principle? the protocol used between the Connectivity service and the Cloud Connector is HTTP. HTTPS is not needed as the connection is protected via the secure TLS tunnel. Is it possible to use Basic Authentication in the above. Yes, you can. But for this, you’ve to use SAP’s provided JAVA based connectivity app which access CF destinations and forward your request. And in the destination, you use basic authentication. Sarthak Sharma Can you eloborate a bit more? I sucessfully connected a UI5 app, using the MTA CF deployment feature of Web IDE Full-Stack. It created the connectivity and uaa services automatically. However, the app prompts for basic auth at startup. On entering valid backend credentials, it works just fine. I already selected basic authentication in the CF destination settings and stored the same user/password combination. Yet, the auth popup in the deployed UI5 app still appears. PS @ Ram Prasath Satheesh did you have any luck? The credentials you stored in the destination is for the destination only. This means, whenever you use the connectivity and destination services to connect to another system, those credentials will be used. However, the one that you’re prompted to enter while opening your app are for the XSUAA service. Whenever you run the app for the first time, it’ll authenticate you. If you don’t want this and want to make your app public, you can unbind the XSUAA service reference from your app. Moreover, whenever your app uses the destination, it uses the credentials stored with the destination. I can describe more once I look at your xs-app.json file. I did know about the UAA service, so the first login with CF credentials is expected. However, the app does not use the stored authentication for the destination. So after CF login, there is an additional basic auth browser popup, asking for the backend credentials. That’s what puzzles me. Yes, I’m able to connect and it is working for us. you are trying to connect to a system in a non-default client. ( It can easily be resolved by using ?sap-client=clientId in metadata call). In the part 2 of this blog, I am done with the step 1 : ‘Creation of the destination and the destination instance’. But when I following the step 2 for ‘Creation of the connectivity instance’ , I am not able to create the destination service either via SCP cloud foundry trial account or through the command prompt as well( CLI ). “Unable to create service instance. We are sorry, but we have encountered an internal error. If the problem persists, please create a support ticket. Is there anything which I missed or something needs to maintained in cloud foundry trial account with respect to registration, configuration ? Would you please provide some insights on this ? please ask the admin of the global account to add quotas (destination service) for your subaccount in the entitlement section of the global account. Then you should be able to create an instance. I have the same issue. Is there a solution? Thank you! I’m having with the same issue. Did someone find a solution for this? Looking forward to the part 3 principal propagation! The Source code link given at the bottom of the page has expired. Can i request you to please restore the link ? thanks for the feedback. The link has been now updated. I tried to connect my UI application using the reference from the source code given at end of the page. Below are the destination and manifest i am using. The app router works fine as well as the UI application works fine but the application is not able to get Destination from the cockpit and further doesn’t connect to the onPremise system. Is there anything missing? have you called your destination “abapBackend1” or are you using maybe another name? Can you please check in the SCC if it receives at least the request? Good job keeping this blog, it is very helpful and easy to follow. I downloaded applications from the given link and could deploy the App router application just fine in Cloud foundry. I tried with deploying both zip as well as war file. Neither could not be deployed successfully. Could you please help with any suggestions. Deployment worked when deployed using cf push. We have a multi-tenant solution which exposes REST APIs to be consumed by tenants. We have created a service broker implementation for our app. A customer would create a subaccount and then create a service instance of our service and generate a service key. Using this service key, they can access our APIs. The customer may also be using a S4 cloud/OnPremise backend system. Now, if we have to implement a feature which requires a connection to the customer’s backend system, how do we use the destination and connectivity services in such a multi-tenant scenario? did you already found some documentation to combine multitenancy with onpremise access on CF? Thanks for sharing this block it is really helpful. 2018-03-21T06:32:33.645+0000 [STG/0] ERR No container can run this application. Please ensure that you’ve pushed a valid JVM artifact or artifacts using the -p command line argument or path manifest entry. Information about valid JVM artifacts can be found at https://github.com/cloudfoundry/java-buildpack#additional-documentation. Kindly help how to resolve this, i tried using the cf push also its giving the same issue. You will find on the sharepoint another file called “connectivity-app-demo.war”. This should work with this file. Thanks for the information, i tired with connectivity-app-demo.war with the manifest file and now i am getting following error. First of all, thanks for this blog. The message that log generates it’s about parsing JSON when the cloud is trying to execute “approuter.js” file inside approuter package (@sap/approuter). I also tried the same version of approuter that you have used in your application and it failed again. Did you have the same problem in any part of your development process? Is there anything that i can do to solve it? My question is, you created a destination, connectivity and a trust service. But how you reference the destination you created in the cookpit “abapBackend1”? I’m glad you liked the blog. 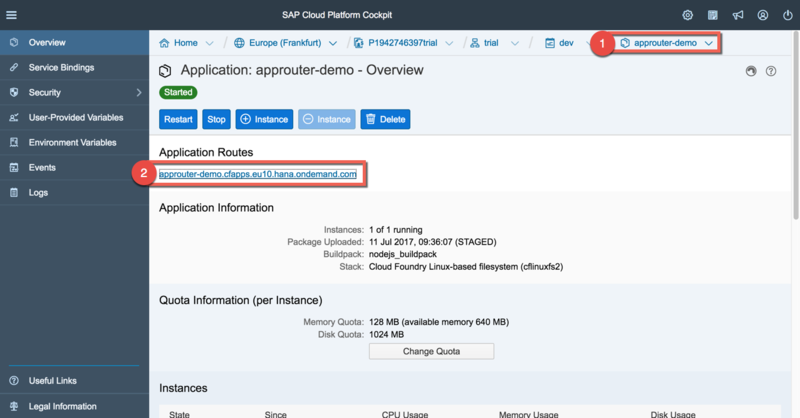 Please take a look at the documentation of the Destination Service regarding Cloud Foundry Environment (https://help.sap.com/viewer/cca91383641e40ffbe03bdc78f00f681/Cloud/en-US/7e306250e08340f89d6c103e28840f30.html). It should contain any information you need. In case you still have problems let me know. Philipp, thanks for your answer. and I created an MTA application in CF that contain UI5 application. The UI5 application supposed to get data from success factor via odata. So I created a destination service and bind it to the MTA application, but several pieces are missing from my side. i need to use this URL https://connectivity-app-demo-p193274639trial.cfapps.eu10.hana.ondemand.com to connect to my on-premise system from my custom MTAR application. I tried under required resources and modules at yaml file, but i am getting 404 not found error, Please help me how to use that URL as micro service in my custom MTAR application, here in my mtar application the app router will be defined by default. we can’t you/SAP/we extend the application router to do this jwt “shuffling” needed for the onpremise access? Why would one need a separate web application just for this? Isn’t this better done in the application router which does already some jwt handling? I just replied with the same question as you had. Do you have any ideas until now? well, we could try to extend the application router ourselves. Unfortunatly I am currently lacking time to do this. Besides that I hope that somebody at SAP finds time to get this working out-of-the-box with the application router. Thank you Wolfgang for asking this question! Matthieu hope you find time to give an answer here. a colleague is finalizing a tutorial that exactly demonstrate it. I will add the link here as soon as it’s available. same opinion as last post from Wolfgang. It does not make sense for me to implemenent this over and over again, especially for simple UI5 applications that just need to connect to an on-premise ODATA Service and have no application logic layer in the cloud. In the neo environment, this also works out of the box and is handled by the ui5 application container runtime. 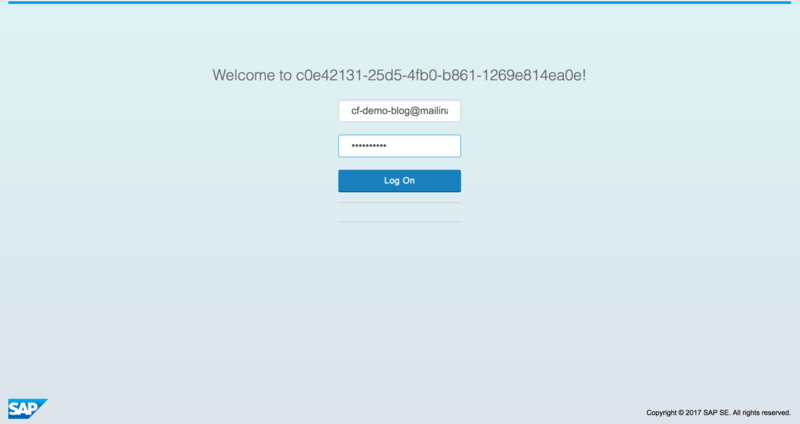 There we just deploy the ui5 app and it works. Would it be possible to replace this layer with api management? Can it do something like that? Thanks for this amazing blog series. I have a question here. I am planning to achieve the same thing with ES5 Odata url and UI5 Module. I have created the approuter app and able to see the login page. It means that configuration of xuaa and approuter is fine. But I did not understand , how the rest of the part could be done for simple HTML5 module. When I am creating the html5 module , wizard created a mta.yaml file but what should be content of this file apart from module information. As I am not adding the Java module how to replace the Java related stuff from UI5 point of view. is there something similar for Python ? I was trying to set up the destination and calling it from python, but failed. Cloud connector is available and the destination and connectivity instance is also createdd. But how would I call the CC from Python now ? Have you solved your issue? I encounter the same issue as you. Any idea about the issue in the screen shot? This is happening while checking the connection of the CF destination configured. Note : Cloud connector configuration is successful for the on-premise system, CF sub-account is successfully added in CC. The button “Check connection” works today only for cloud destinations, not for on-premise destinations. So this is actually a bug 😉 This will be fixed soon. Thanks for the info. This does not mean that On-Premise connectivity does not work. It simply means that the Check button is not working and I can proceed with the Nodejs app development consuming on premise oData service as explained in the below blog. We have gone ahead with the development following the below blog written by Maria . We are facing below issue when we run the project. Any idea about this error ? I guess a on-premise destination is needed. working for me without problems. Now npm install @sap/approuter –save should download the package. I guess the sharepoint link is expired. Can I have the link to the source code? Do you know if it is already possible to use JCO (rfc) On-Premise with cloud foundry? I have tried a the Tutorial: Invoke ABAP Function Modules in On-Premise ABAP Systems. But it does not work, the JCo lib in maven does not exist (pom.xml) and I can not test my connection by the test button. In the NEO environment it is OK, but in Foundry NO. Could you pass me some documentation of how I can in my java application connect with my On-Premise server via RFC.